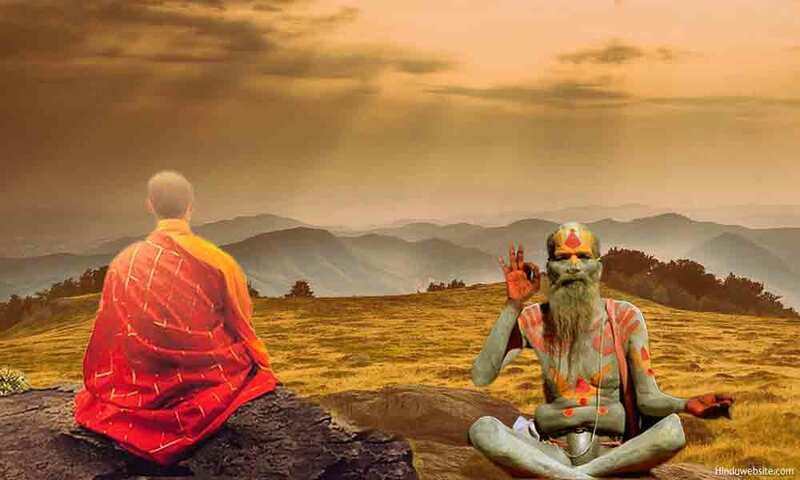 Although Hinduism and Buddhism originated in the Indian subcontinent and thrived in identical geopolitical environment, both are fundamentally different belief systems, with some similarities and major differences. Hinduism is essentially, a theistic religion which believes in the existence of God as the Creator and upholder of all, and in eternal souls. Buddhism is an ascetic, monastic, semi-atheistic tradition which does not believe in God or in souls. Yet both prescribe many identical spiritual practices and meditation techniques for the purification of the mind and body with differences in their approach. In this essay, we examine the divergent approaches followed in Hinduism and Buddhism with regard to their meditation and contemplative practices to achieve liberation. Hinduism and Buddhism have liberation as their highest goal, popularly known as Nirvana in Buddhism and Moksha, Mukti or Kaivalya in Hinduism. For the Buddhists, Nirvana is complete freedom from modifications, formations, becoming and being. They do not prefer to speculate upon it, but know that Nirvana is total freedom from desires, attraction and aversion, births and deaths and thereby freedom from existential suffering. For the Hindus, Moksha does not only mean freedom from desires, mortality, embodiment, births and deaths and suffering but also returning to their transcendental state and entering the immortal world of Brahman or the Supreme Being where they can exist eternally in a blissful state, never to worry again about rebirth or mortality. For the Hindus, the souls are infinite, eternal, omniscient and pure. When they become enveloped by the finite realities (tattvas), they become embodied selves and remain bound to the cycle of births and deaths until they achieve freedom. Buddhism does not believe in the existence of eternal souls, but in temporary beingness or the formation of the physical self. Both religions also fundamentally differ with regard to their approach to discern reality. Buddhism relies upon the outward, mindfulness approach which helps its practitioners see the objective reality with greater clarity and intelligence, and Hinduism upon the inward, contemplative, restful approach, which leads its followers to the state of Self-absorption (Samadhi) where they experience the subjective reality of the Self without any duality and delusion. One can see these different approaches in Hinduism and Buddhism. In this essay, we discuss the different strategies or approaches followed in the meditative or contemplative practices of Hinduism and Buddhism. From a Buddhist perspective, nothing is permanent or fixed in our existence. Everything is subject to decay and destruction. The impermanence of Anatta which we objectively experience is where our source of suffering. The right approach is to look for the causes and resolve them rather than withdrawing from it and escape into some unknown reality which we can never conceptualize or comprehend. In Buddhism also withdrawal happens in the advanced stages of meditative absorption (jhana). However, it is withdrawal from the objects of the mind, body and the world, within the realm of the objective reality, not from it, which leads to rapture and purification of the consciousness. Therefore, Buddhists believe that it is better to begin with the known rather than the unknown, and it is safer to look for solutions in the current reality of the present moment, rather than in some metaphysical notion of some inexplicable state that cannot humanly be experienced in wakeful or mindful state. One cannot resolve suffering by putting the mind to sleep or escaping from the objective reality, but becoming more aware, more awake and more mindful. Speculating upon the Self and its reality is a mere intellectual effort and which does not mitigate suffering. Besides, if the suffering arises from our interaction with objects, we must look for solutions there rather than contemplating upon the Self which does not in anyway creates that suffering. Hinduism believes in eternal and indestructible souls and in the existence of the subjective, unchanging, imperishable transcendental reality of the Self in contrast to Buddhism which denies the existence of eternal souls and relies upon the objective, physical reality of the perceptual world to resolve suffering. The Atma reality represents the true subjective reality in which the subject alone remains without any objectivity or otherness, and without any means of knowing such as the senses or the faculties of the mind. The subjective reality of Self (atma jnanam) is experienced by the withdrawal of the mind and senses from the external objects and engage them in the contemplation of the Self. When the mind subsides in itself and the senses go into restful mode, The Self manifests itself all by itself, without the need for any external support. The subjective state in which in which only the Self-remains all by itself is called the Samadhi (self-absorption). It is the reality without the distinction of subject and object and without the process of knowing. The Self is all knowing. It knows by itself without the need to depend upon any external means. Hinduism believes that existential suffering cannot be totally removed from our lives. It is even futile to do so because it is how the world is created. Association with the world and involvement with it is the chief cause of suffering. In contrast, the soul is said to be eternally blissful, pure and unchanging. Therefore, if we can somehow manage to enter that state, our suffering becomes automatically resolved. Just as one has no knowledge of any suffering in deep sleep, one becomes oblivious to suffering when one is in the state of Self-absorption. One may practice mindfulness, but it is to cultivate detachment and distaste for worldly life. Hinduism therefore focuses upon withdrawal of the mind and senses from the objective reality to suppress the modifications of the mind, practising austerities, disciplining the mind and body to cultivate sattva, subduing the desires and attachments, renunciation of worldly life, resting the mind in the contemplation of the Self, and becoming a passive witness to the happenings within the consciousness and outside. Hindus may practice mindfulness meditation, but its ultimate aim to achieve equanimity and freedom from the modifications and afflictions of the mind so that it can rest within itself and enter the stateless state of Samadhi. Thus, we can see that although outwardly both seem to practice similar or identical techniques and practices to reach the same goal of liberation they differ in their emphases and approaches to reach their goals. Their concept of liberation is also different. In Buddhism, the emphasis is upon knowing the objective reality with mindfulness. In Hinduism, it is knowing the subjective reality of the Self by silencing the mind. While in Buddhism, one observes the thoughts, feelings, emotions, and different states of awareness to understand their implication to human suffering, in Hinduism one does it to cultivate witness consciousness and rest the mind in the thoughts of God or self. In Hinduism, meditation is an adjunct to various other Yogas such as karma, jnana, sanyasa and buddhi yogas. In Buddhism, it is an adjunct to the practice of the Eightfold Path (right living) to cultivate discernment (buddhi). In Buddhism, mindfulness is practiced to resolve suffering through insightful awareness by tracing their causes in the experiential realm. In Hinduism, the effort is to transcend them by becoming equal or indifferent to the dualities, attraction and aversion, and pairs of opposites. Nowadays, you may see Hindus practicing various techniques, including mindfulness practice, active and passive meditation techniques to overcome stress or find temporary relief from their mundane problems. These are temporary methods aimed to derive instant gratification. If liberation is their aim, they have to withdraw their minds and remain focused upon their selves only to experience the transcendental, subjective reality.